Use the menu below to select the appropriate CATERPILLAR diesel engine. 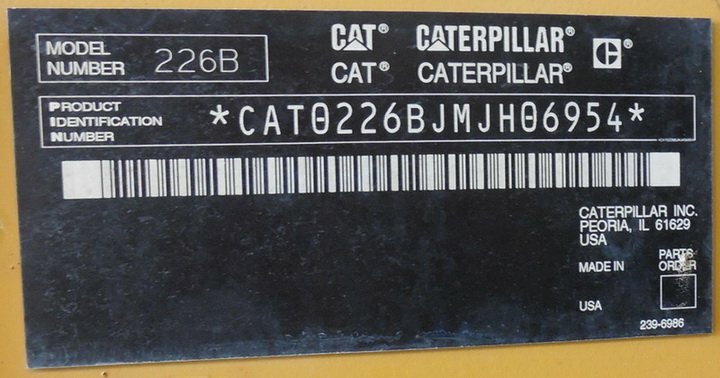 Effective First Quarter 2001 the Caterpillar Product Identification Number (PIN) has changed from 8 to 17 characters. It is the latest version of the product identification numbering standard. Non-road machine PINs are defined by ISO 10261. MJH - Machine Indicator Section (MIS) or Product Sequence Number (characters 10-17: first three are letters / or letters and figures / or figures only are prefix and last 5 are figures). These were previously referred to as the Serial Number where MJH was prefix. Machines and generator sets produced before First Quarter 2001 will maintain their 8 character PIN format. Components such as engines, transmissions, axles, etc. and work tools will continue to use an 8 character Serial Number (S/N). See sample for C32 diesel engine: RNW00152 (RNW - prefix). Sometimes producer did not print on the engine's (or old machinery) plate zero between prefix and first number. Serial number is like this: RNW152 or RNW0152. Full and correct is RNW00152. What are the Caterpillar manuals? The operation and maintenance manual contains safety, operation, transportation, lubrication and maintenance information. Continuing improvement and advancement of product design might have caused changes to your machine which are not included in the operation and maintenance manual. The operation information is a reference for the new operator and a refresher for the experienced one. This information includes a discussion of gauges, switches, machine controls, attachment controls, transportation and towing information. The maintenance information is a guide to equipment care. The illustrated, step-by-step instructions are grouped by servicing intervals. Items without specific intervals are listed under When Required topics. Items in the Maintenance Interval Schedule are referenced to detailed instructions that follow. Read, study and keep the operation and maintenance manual with the machine. Disassembly and Assembly manuals - Step by step instruction with photos, drawings and instruments. Specification manuals - Drawings with clearances, gaps and torques. Systems Operation Testing and Adjusting manuals - How works, testing and adjusting the engine mechanism and engine in operation and after repair. Troubleshooting manuals - Very important manual for repair, testing and adjusting of the engine. General service Information. Special Instruction. Technical Information Bulletins (TIBU).Additional information for repair and operation. Please keep in mind that the special instruction and technical bulletin (service letter) has priority over manual. Drawing with each part number, quantity, and Parts name for ordering spare parts of the machine (engine).